Moza is the daughter of Nasser bin Abdullah Al-Misned, a well-known opposition activist and the former head of the Al Muhannada confederation of Bani Hajer. After being released from prison due to his political activities and as an act of defiance against the policies of the deposed former Emir Ahmad bin Ali Al Thani, Nasser bin Abdullah led the entire Al Muhannada clan into self-imposed exile to Kuwait in 1964. Nasser returned to Qatar with his immediate family in 1977, the year in which his daughter Moza married Hamad bin Khalifa Al Thani, when he was heir apparent of Qatar. She received a BA in Sociology from Qatar University in 1986, and was awarded an honorary Doctor of Humane Letters from Virginia Commonwealth University in 2003. Sheikha Moza with her husband at the White House in Washington, D.C.. From left to right: Sheikha Moza, Michelle Obama, the US First Lady, Sheikh Hamad bin Khalifa Al-Thani, and Barack Obama, the US President. Sheikha Moza co-founded and chairs the Qatar Foundation for Education, Science and Community Development(QF), which was set up in 1995. Sheikha Moza also acted as chairperson of Silatech since 2008, chairperson of the Arab Democracy Foundation, and president of the Supreme Council for Family Affairs since 1998. She has been vice-president of the Supreme Education Council since 2002 and was UNESCO's Special Envoy for Basic and Higher Education in 2003. Currently[when? ], she serves as a member of the Board of Overseers for Weill Cornell Medical College. Besides this, she is the chairperson of Sidra Medical and Research Center, a high-tech women's and children's hospital in Doha. She also endowed this medical center with $7.9 billion. She is also the chairperson of the organisation "Your Link". 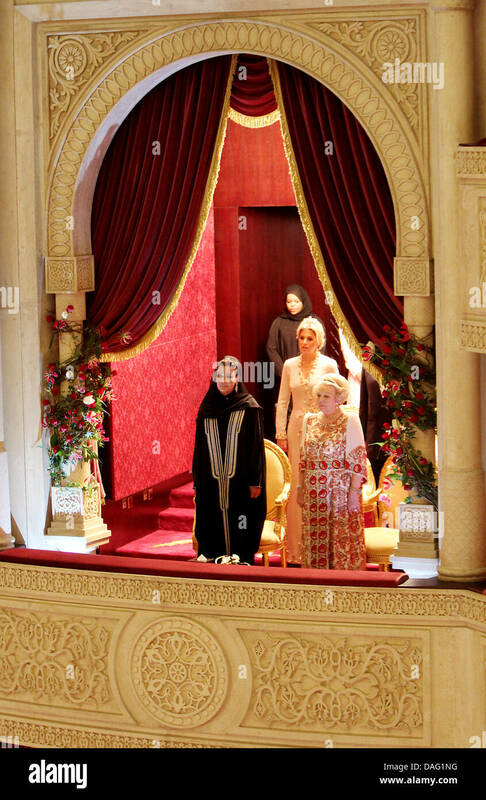 Unlike many other monarchical wives in the Middle East, Sheikha Moza has been a high-profile figure in her nation's politics and society, actively involved in Qatar's government. She was a driving force behind Education City and Al Jazeera Children's Channel. She is the owner of Le Tanneur, a French leather-goods manufacturer. Additionally, she has been named as one of Forbes' 100 Most Powerful Women at #75. As the public consort of the emir, she has represented Qatar alongside her husband and on her own at many international events, including state visits and royal weddings. She has become known for her personal style, customising haute couture designs to fit Qatari modesty rules. She works with the UN to support global education and has been selected as a UN Advocate for the Sustainable Development Goals. Sheikha Moza initiated the World Innovation Summit for Health (WISH), a forum for innovative solutions to international health challenges. Moza may be styled as "Her Highness Sheikha Moza bint Nasser". Sheikh Jasim bin Hamad bin Khalifa Al Thani (born 1978) – heir apparent of Qatar until 2003. Sheikh Tamim bin Hamad Al Thani, Prince of Qatar (born 1980) – heir apparent of Qatar (2003–2013), current Emir of Qatar. Sheikha Al-Mayassa bint Hamad bin Khalifa Al-Thani (born 1983). Sheikh Joaan bin Hamad bin Khalifa Al Thani (born 1986). Sheikh Mohammed bin Hamad bin Khalifa Al Thani (born 18 April 1988). Sheikh Khalifa bin Hamad bin Khalifa Al-Thani (born 11 November 1991). Sheikha Hind bint Hamad bin Khalifa Al-Thani (born 1984) – director of the Emir's Office since 2009. ^ a b "الشيخة موزا بنت ناصر المسند". Aljazeera.net. Retrieved 17 November 2017. ^ "Mozah Bint Nasser Al-Missned, Her Highness Sheikha". Themuslim500.com. Retrieved 17 November 2017. ^ "Independent Imperial College London awards its first degrees". 3.imperial.ac.uk. Retrieved 17 November 2017. ^ a b "ناصر بن عبد الله المسند - المعرفة". Marefa.org. Retrieved 17 November 2017. ^ Danna Harman (5 March 2007). "Backstory: The royal couple that put Qatar on the map". Christian Science Monitor. Retrieved 23 May 2015. ^ "Biography of Her Highness Sheikha Mozah Bint Nasser Abdullah al Missned". Portal.unesco.org. Retrieved 23 May 2015. ^ "Moza bint Nasser Ph.D.: Executive Profile & Biography - Bloomberg". www.bloomberg.com. Retrieved 15 December 2017. ^ "Her Highness Sheikha Mozah Bint Nasser Al Missned". UNAOC. Retrieved 17 November 2017. ^ "Her Highness Sheikha Mozah, UNESCO Special Envoy for Basic and Higher Education, hosts Regional Conference on Literacy Challenges in the Arab Region in Doha, Qatar". UNESCO. Retrieved 17 November 2017. ^ "Sheikha Mozah Bint Nasser Al-Missned". Forbes. Retrieved 15 December 2017. ^ "About – Sidra Medicine". www.sidra.org. Retrieved 15 December 2017. ^ "Les vies secrètes de Dominique de Villepin". Lexpress.fr. 28 May 2015. Retrieved 17 November 2017. ^ "Sheikha Mozah Bint Nasser Al-Missned". Forbes.com. Retrieved 17 November 2017. ^ "Who's Who in Qatar: The People of Qatar You Should Know About - Marhaba l Qatar's Premier Information Guide". Marhaba.qa. Retrieved 17 November 2017. ^ "Sheikha Mozah in Spain". Order of Splendor blog. Retrieved 17 November 2017. ^ "Sheikha Mozah The Qatar first lady that makes Carlà tremble". Vogue. Retrieved 17 November 2017. ^ المتحدة, مركز الأنباء التابع للأمم. "مبادرة من الشيخة موزة بنت ناصر لدعم برامج اليونسكو الأساسية". Un.org. Retrieved 17 November 2017. ^ "وزارة التعليم و التعليم العالى- تفاصيل الخبر". Edu.gov.qa. Retrieved 17 November 2017. ^ "Her Highness Sheikha Moza bint Nasser – Sidra Medicine". www.sidra.org. Retrieved 15 December 2017. ^ "Biography". Mozabintnasser.qa. Office of Her Highness Sheikha Moza bint Nasser, State of Qatar. Archived from the original on 23 August 2015. Retrieved 29 August 2015. ^ "United Nations Goodwill and Honorary Ambassadors—Her Highness Sheikha Moza Bint Nasse". Unesco.org. UNESCO. Retrieved 29 August 2015. ^ web, Segretariato generale della Presidenza della Repubblica-Servizio sistemi informatici- reparto. "Le onorificenze della Repubblica Italiana". Quirinale.it. Retrieved 17 November 2017. ^ "Semakan Penerima Darjah Kebesaran, Bintang dan Pingat". Istiadat.gov.my. Retrieved 17 November 2017. ^ "wearing the ribbon bar of the order at the Dutch state visit to Qatar". C7.alamy.com. Retrieved 7 August 2017. ^ "MINISTERIO DE ASUNTOS EXTERIORES Y DE COOPERACIÓN : 7191 Real Decreto 588/2011, de 20 de abril, por el que se concede la Gran Cruz de la Orden de Isabel la Católica a Su Alteza la Jequesa Mozah Bint Nasser, del Estado de Qatar" (PDF). Boe.es. Retrieved 17 November 2017. ^ "Photographic image" (JPG). S-media-cache-ak0.pinimg.com. Retrieved 17 November 2017. ^ "Photographic image" (JPG). Spletnik.ru. Retrieved 17 November 2017. ^ "Photographic image" (JPG). 1.pictures.zimbio.com. Retrieved 17 November 2017. 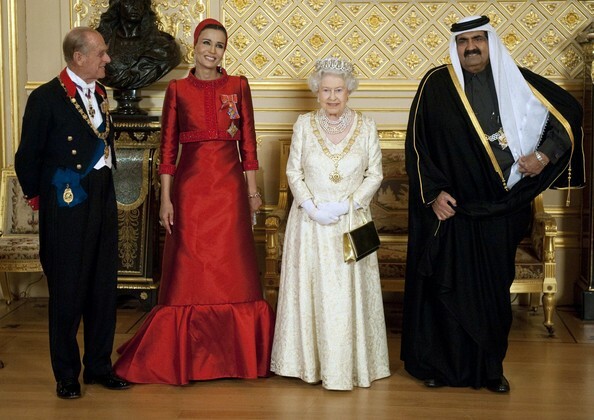 ^ "Qatari State Visit To the UK Photos and Images". Getty Images. Retrieved 17 November 2017. ^ "Chatham House Prize 2007 - HH Sheikha Mozah". Chathamhouse.org. Retrieved 17 November 2017. ^ "Home - The Peninsula Qatar". Thepeninsulaqatar.com. Retrieved 17 November 2017. ^ "Medalists - Carnegie Medal of Philanthropy". Carnegiemedals.org. Retrieved 17 November 2017. ^ University, Carnegie Mellon. "Past Recipients-Honorary Degrees - Carnegie Mellon University". Cmu.edu. Archived from the original on 4 March 2016. Retrieved 17 November 2017. ^ "Sheikha Moza accepts Bush Award for public service excellence". M.gulf-times.com. Retrieved 17 November 2017. ^ "Her Highness Sheikha Moza bint Nasser of Qatar will be presented the George Bush Award for Excellence in Public Service - University of New England in Maine, Tangier and Online". Une.edu. Retrieved 17 November 2017. ^ "Her Highness Sheikha Mozah reminds VCU graduates of limits of technology". Qatar.vcu.edu. Retrieved 17 November 2017. This page was last edited on 16 March 2019, at 07:55 (UTC).